First things first, as yesterday was my son’s 2nd Birthday (Happy Birthday baby boy!) I decided not to do a top 5. I suggested the topic of Bond themes but I have chosen not to post this week. With that out of the way, I’ve also made the decision to write a really personal post. I’m not even sure as I type this whether I’ll post it or not. I’m not even sure whether it’s a good idea to write about this. A lot of how I feel on this contributes to my depression, hence why I feel like writing about it. But at the same time, I know that how I feel is a bit silly and almost unnecessary. At some point in their lives every girl dreams about their wedding day. The day when they commit to spending the rest of their lives with the love of their life. I’m no exception. Although I actually had 2 different weddings in mind – a dream, idealistic wedding and a more realistic, affordable wedding. My dream wedding was in Cinderella’s castle in DisneyWorld, followed by a reception with Mickey & Minnie in attendance (I know I know, I literally was living in dreamland though!). My more realistic wedding is one I still want to this day. A small church wedding, in the countryside, with a small disco reception with a hog roast or something. 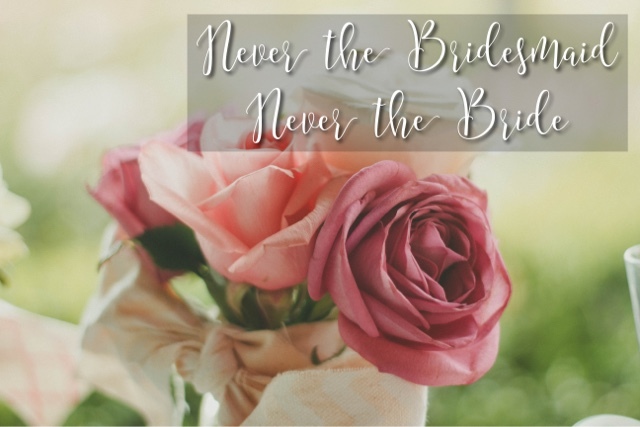 Throughout my life I have only ever been a Bridesmaid once, and that was for my parents wedding so I’m not sure that even counts – never the bridesmaid, never the bride. I’m also not married and never have been. I’ve been with my partner for 10 years now so some might expect us to be, especially since we have a son together. But, sadly not. It’s not completely his fault. I do remember one time just before my 21st birthday, I was asked if I wanted to get married on my 21st, and I said no because I wanted my 21st to be just that, my 21st. Since then, we’ve had very little money after buying our own house and the topic, quite frankly, seems to terrify him. So basically, I’m now thinking that I will never be the bride, I will never be a wife, and this makes me feel sad. Very sad. While everyone else in school was dreaming about their careers, I was dreaming about being a wife and having a family of my own. I know how I feel seems completely ridiculous, after all I do have my family and I know marriage isn’t everything. But that doesn’t stop it making me feel the way I do. We have a wedding reception to go to this evening for Tim’s 2nd cousin and I’m sort of dreading it. I like to try to avoid weddings & wedding receptions at all costs because of how they make me feel. There’s a line from a recent episode of Pretty Little Liars that sums it up perfectly – ‘even if you’re happy for the person there’s just, like, this dull ache‘. Next Post Five Favourite Friday | Animals at Dudley Zoo!